While shopping for clothes at our local mall recently, we stopped by Auntie Anne’s and picked up some Nuggets. They were absolutely amazing. 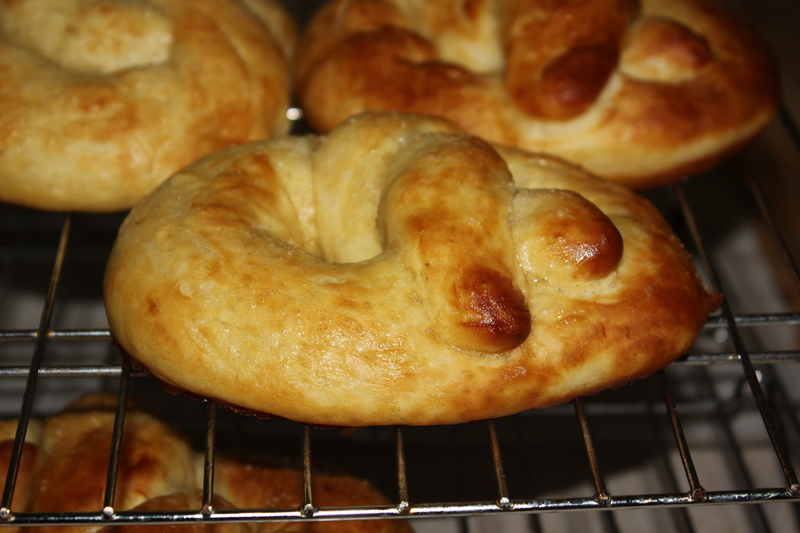 They tasted just like the Auntie Anne’s Pretzels we’ve been making, except they were in nugget form. Use this recipe and follow the instructions up to when you divide the dough. Instead of dividing the dough into 12 lumps roll it out into a rectangle roughly 8″ x 12″. Using a pizza cutter cut the dough into 48 pieces by cutting the it into 8 strips on the short side then cutting each strip into 6 pieces. Each “nugget” should be about 1″ x 2″. Dip in the baking soda and water mixture, place on a greased pan, and cook until the bottoms are a medium brown. Ours took about 6 minutes. Now dip in butter and enjoy! Breakfast is my least favorite meal, unless we have something good (think pancakes, waffles, breakfast casserole, etc.). I don’t like very many cereals which is of course the normal breakfast food. But my new favorite thing to have for breakfast is a smoothie/shake. They’re relatively easy to make, taste good, and are also good for you. My favorite smoothie/shake so far is my Chocolate Peanut Butter Banana Milkshake . But another good one, and probably healthier since it doesn’t have chocolate syrup, is a Mango Pineapple Smoothie. My sister came up with this recipe and I thought I’d share it with you. 1. Combine the juice, yogurt, and chia seeds in the blender. Blend on high to combine. 2. Add the fruit and blend until smooth and the consistency is to your liking. To make it thinner at more juice and to make it thicker add more fruit. For ease in printing download the PDF file: Mango Pineapple Smoothie. I’m a swimmer on a competitive swim team, therefore I eat a lot. I also love chocolate, peanut butter, and milk but hate bananas. This is one of my favorite milkshakes. After a morning practice I come home and make several batches of this (necessary so that everyone home gets some). This shake has a chocolate peanut butter flavor but you can’t taste the bananas at all. That’s why, even though I hate bananas, I love this shake. My sister came up with the exacts for this recipes though none of it gets measured out, just estimated. Depending on the size of the bananas the shake may be smoother or thicker. To get the right consistency you can either add more bananas or add more milk, it’s whatever you like. I hope you enjoy it. Combine Milk, Chocolate Syrup, and Peanut Butter in Blender. Mix until combined. Add frozen Bananas and blend on high speed until shake is smooth. I have also created a PDF copy for ease in printing. You can download it by clicking this link: Chocolate Peanut Butter Banana Milk Shake. You can also access any of my recipes on my new recipe page I’ve just created which can be accessed at the top of the page. Enjoy!